Do you suffer from presbyopia and have difficulty seeing the front of the handgun? We can help! Having hosted a prescription shooting glasses website for the past twelve years, (shootersoptometrist.com) I cannot count the number of inquiries from handgun shooters complaining of not being able to focus on the front sights of their handguns. These complaints always come from people over forty years old. Is there anything that can be done to help these people? Fortunately, there is. First it is helpful to understand why this happens. As we age the crystalline lens in our eye looses its elasticity. The medical term for this condition is presbyopia. At first it is not a problem. You start to hold your reading material further away, increase the amount of light on your paper and change the angle of your material to focus clearly. As time goes on these remedies lose there effectiveness. Some people purchase "over the counter" reading glasses and see very well with these. Other folks break down and make an appointment to see an optometrist. Upon getting an "ocular" clean bill of health they are prescribed reading glasses, progressive addition lenses or conventional bifocals. These people return every two years for an updated prescription and life goes on. Pistol shooters are exempt. Before age forty and presbyopia, going to the shooting range with a handgun was an enjoyable experience. The front sight, target and even the rear sight were in focus, but now, not so much! So, can spectacles help? 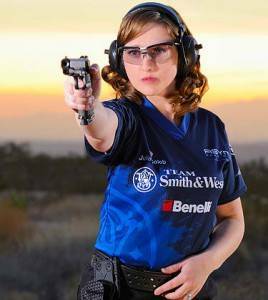 First of all, progressive addition lenses will not help pistol shooters. I know because I have tried it many times with different patients. There is too much distortion in the peripheral area of these lenses and they create more problems than they solve. • A measurement from the eye to the front sight of your handgun. With this information, it is possible to prescribe a lens that keeps your front sight clear. Serious presbyopic pistol shooters should have a pair of shooting glasses for range shooting. Now that we have the front sight in focus we should discuss frames. The two most popular frames for handgun shooting are made by Decot and Randolph-Ranger. These frames are available in three sizes and two colors. Decot and Ranger XL frames sit up high, have large lenses and the bridges are vertically adjustable. Add to this flex cable temples, silicone nose pads, a hard case and easy change lenses; you now have a well designed ophthalmic quality frame for pistol shooting. Law enforcement officers should have a pair of plus glasses for their qualifying and range shooting. For real life situations this is not the case. These circumstances require the officer to see the target and shoot differently. The easy change lens feature of Decot and Ranger frames make this simple. Only one lens need be changed; your dominate shooting lens. This concept applies to IPSIC and cowboy action shooting as well. Lens material is either CR 39 or polycarbonate. Today 95% of shooting glass lenses are CR 39 with a scratch resistant coating. These lenses work great in Decot and Ranger XL frames and provide physical protection to your eyes. Optional lens coatings? Absolutely. All clear lenses should have an anti-reflective (AR) coating applied to them. The amount of light transmitted through a clear spectacle is 92%. Eight percent of light is lost to reflection. The AR coating increases the amount of light transmitted to 99%, and the seven percent increase is noticeable. AR coatings are applied to binoculars, cameras and rifle scopes for a good reason. They eliminate ghost images and improve visual acuity, especially under low light conditions. As far as tints are concerned some people see better with a light gold tint at dawn or dusk. My personal preference for a low light lens is still clear, with an AR coating. Properly designed, fitted ophthalmic quality eyewear is necessary for the presbyopic pistol shooter. An eye health examination and an accurate refraction are the first steps. Small amounts of farsightedness, nearsightedness and astigmatism are significant and require correction. A measurement of the distance from your eye to the front sight of your handgun is critical. Physical protection, provided by the lenses may prevent serious eye injury. Law enforcement officers, IPSIC and cowboy action shooters over the age of forty can benefit from properly fabricated shooting glasses.